Whether you want to create a unique ringtone from your favorite movie song or just show off how artistic you are, a free audio editor becomes necessary. Everyone who is passionate about music processing will always hope to get the best out of their efforts. It might be a tough decision to choose the most suitable audio editor, given different functions each software provides. As there is a myriad of audio editing software in the market, we have filtered top 5 free audio editor in this post with their main features listed to help you find the one you always need. 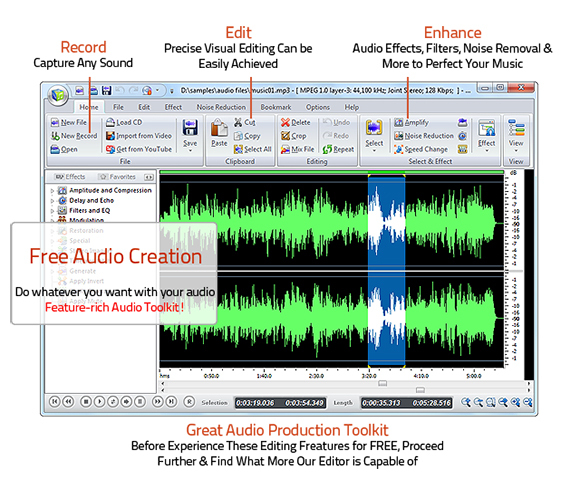 Free Audio Editor is a complete audio editing program which is well known for its simplicity. You can use it for audio editing and recording. As a powerful audio editor, it provides an exhaustive range of functions to smooth out the sound quality. It offers almost everything you need for music creation that both basic audio editing like cut, copy, paste and advanced editing like apply various audio effects can be performed here. It comes with no virus, spyware and extra charge. 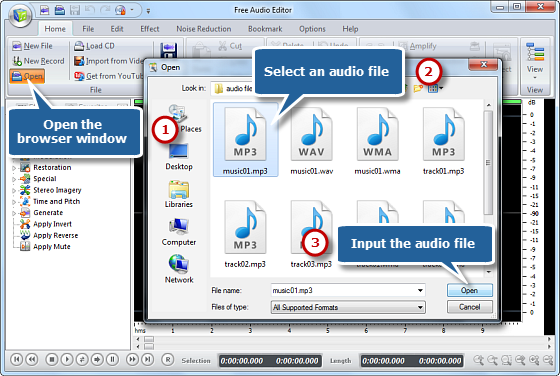 Below we list some simple steps for editing audio with Free Audio Editor. 1. In the “Home” tab, click “Open” and in the new window to choose an audio file. After that, click “Open” and you will see the file will be loaded in the waveform in the program window. 2. Choose an audio part to edit and you are provided 4 ways: use hotkeys, drag your mouse along the waveform, move the slider bar below the waveform and input start/end/length time. Choose any one of them to make a selection. 3. In “Edit” tab, you will find a set of editing tools like cut, copy, paste, delete, crop for basic editing. You can use “Undo” or “Redo” to correct your editing. For more advanced editing, you can apply various audio effects. 4. After finishing your audio editing, back to “Home” tab and find “Save” button. There are 3 options for file storing: “Save File”, “Save File As” and “Save Selection As”. Then, choose an output folder and set the output quality. Check this simple tutorial out to get started with Free Audio Editor. It will take no efforts to edit and enhance your audio and recording. By simple clicking, you can edit the audio and apply various customizable audio effects. 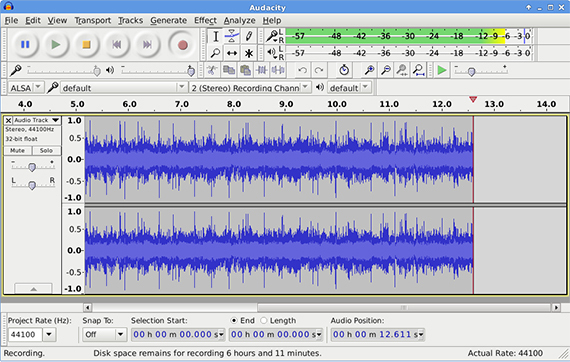 Audacity can be another popular audio editor that most people are familiar with. It supports multi-track audio editing and live recording and it’s compatible with a long list of audio formats like MP3, OGG Vorbis, AIFF, WAV, etc. Apart from basic audio editing features like cut, copy, paste, noise reduction, etc., it comes with more advanced settings. As an open source program, it has an intuitive user interface and some built-in plugins can improve its productivity to a new level. 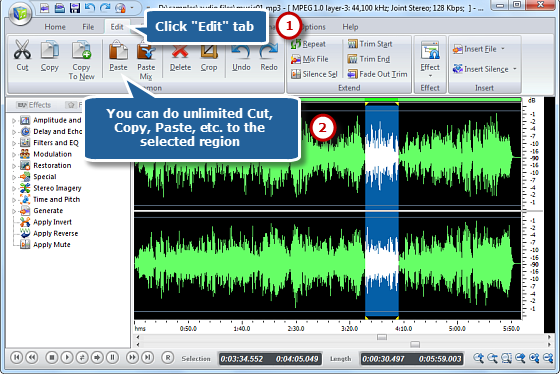 As a beginner, you may find these tips and tricks to use Audacity handy. The good point of this audio editing software is it requires no installation to get it started. You can use it as a portable application on any version of Windows OS. It promises all the functions to edit an audio file including cut, copy, paste, produce music loops, analyze, record, batch convert and so on. For those who have installed VST plugins, it will be a good news to know that Wavosaur is also compatible with VST. This video will show you some basics on how to use Wavosaur. 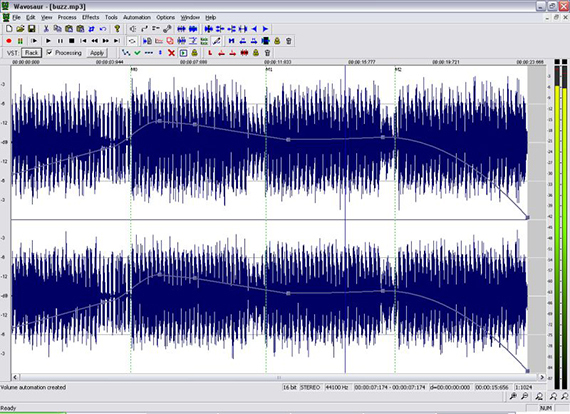 WaveShop is a lightweight and fast audio editing program. 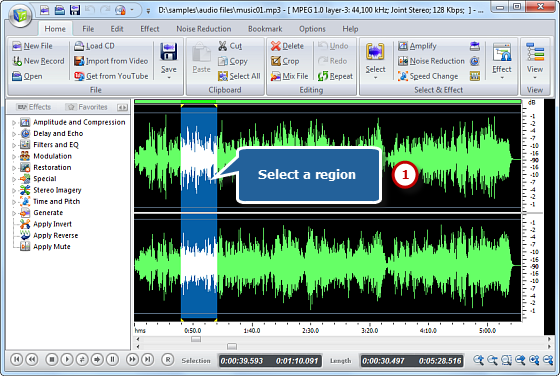 It’s also called a bit-perfect editing tool which means the audio samples won’t be changed unless you need them to be. Using WaveShop, it is possible to manage different types of music tracks with ease like MP3, AAC, FLAC, Ogg, Vorbis, etc. It offers some impressive features including RMS, normalizing, spectral analysis, fading, sample rate conversion, etc. WaveShop is also very easy to use. Let’s find out how to edit audio wit it. For those who don’t want to download and install anything on their computers, TwistedWave Online is just what they need. 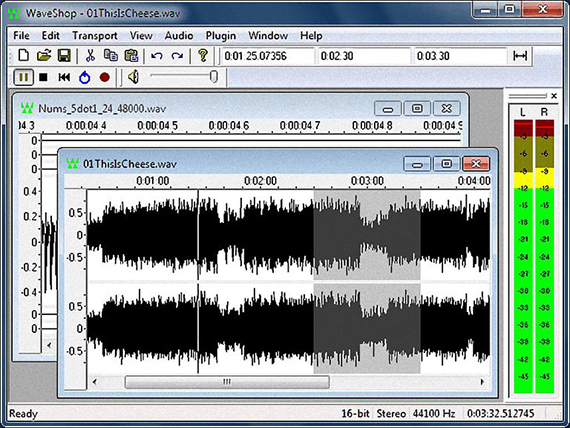 It is an online audio recorder and editor that the audio files will be processed and saved to the server. Whenever you close your browser, it will save all your editing work and next time when you open it, you can still find those audio files you edited and some editing history. It only allows editing a 5-minute long audio file for a free account and for longer file editing, you need to purchase a subscription. Let’s check out how this online audio editor works. However, using an online audio editing service is not recommended. Usually, you will get stuck with various limits, especially when you are in need of editing some big-sized files or long-playing files. Meanwhile, it will require you to upload your audio to their server to finish the editing, and then download the edited file, which takes much more time than editing audio using audio editor software. What’s more, if your audio is private and you don’t want others to access to it, then you should not using online audio editor websites because the site owners can get access your audio (no matter how they promise). 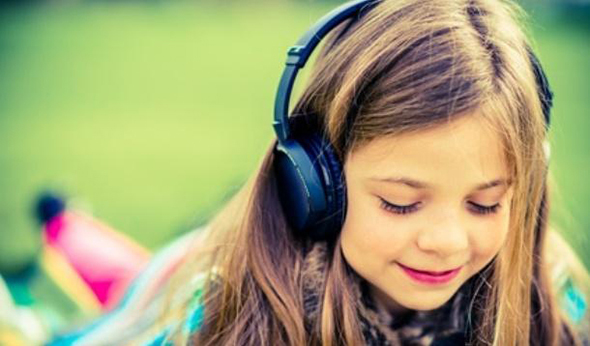 So, download the best free audio editor software to solve these problems once and for all! If you are making audio for video and want to impress your audience with professional-like voice, here are a few tips to follow. Equalize & compress your vocals. Reduce low frequencies & distracting noises. 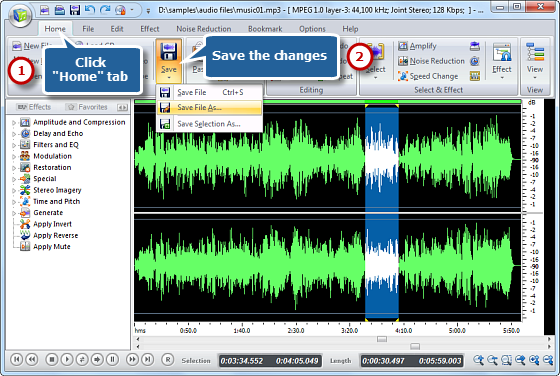 Crossfade your audio to provide a smoother transition between clips. Optimize the playback on all devices via mastering the resulting audio. Sync the audio and video perfectly.